A lot of Apple Inc. stock facts are relatively obscure, despite heavy media coverage of the company. But Apple Inc. (Nasdaq: AAPL) has been around a relatively long time now – nearly 40 years – and so has had plenty of time to accumulate a storied history. And then there's Apple's size. By many metrics, Apple is the biggest or has the most. These are the Apple stock facts that are often hard to wrap your head around. Apple was founded on April 1, 1976 – April Fools' Day. In addition to founders Steve Jobs and Steve Wozniak, there was a third co-founder, Ron Wayne. But Wayne bailed after just 12 days, selling his 10% stake for $800. At 42, he had assets that could be seized if the enterprise failed. Today that stake would be worth tens of billions of dollars, but Wayne has always said he has no regrets. To raise money for the fledgling operation, Jobs sold his Volkswagen bus for $1,500 and Woz sold his Hewlett-Packard programmable calculator for $250. Early on it was decided to assign the employees numbers for administrative purposes. When Wozniak was designated Apple Employee No. 1 because he was the tech wizard designing the computers, Jobs balked. Then Jobs suggested he be given the number zero, acceptable since it was a lower number. That worked for the name badges, but on paychecks Jobs was still Apple Employee No. 2 – Bank of America's check-processing software couldn't accept a zero. Some early critics thought there might be something satanic about Apple. It started when Apple set the price of the Apple I computer at $666.66, and grew when the company introduced its logo of an apple with a bite out of it, conjuring images of Adam and Eve. But Woz chose the price because he liked repeating numbers and "it was easier to write." And the bite out of the Apple happened because it looked better. Those of a certain age might remember that the Beatles had their own record company, Apple Corps. The name conflict led to 29 years of on-and-off legal battles, starting in 1978. At one point, a frustrated Apple Inc. engineer forced to re-name a Mac OS system system alert sound as a result of the dispute came up with "sosumi" (so sue me). The sound lives on to this day in the latest version of Mac OS X. The legal battle ended in 2007 with Apple Inc. buying all the trademarks and licensing them back to Apple Corps. The Beatles catalog finally landed on iTunes in 2010. When Apple expanded into Japan in the early 1980s, it was so unknown there that its computers were shipped in refrigerated trucks. The workers believed they were transporting perishable fruit. Apple's Japan business later grew large enough to merit its own line in quarterly earnings reports. In FY 2015, Japan accounted for 6.7% of Apple's revenue. Apple has had a rare ability to see the potential in new tech. 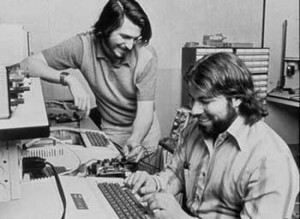 When Wozniak built the Apple I, he offered it to his employer – Hewlett-Packard (NYSE: HPQ). Their response: "HP doesn't want to be in that kind of market." Xerox Corp. (NYSE: XRX) invented the mouse-controlled graphic interface, but waited too long to commercialize it. Jobs saw the prototype in 1979 and put it first in the Lisa, then the Macintosh. History repeated itself in 2000, when Tony Fadell pitched his idea for the iPod music player to RealNetworks Inc. (Nasdaq: RNWK) and Phillips (NYSE ADR: PHG). Both turned it down, and Fadell landed on Apple's welcoming doorstep. Many people still refer to the company as "Apple Computer" or worse still, "Apple Computers." 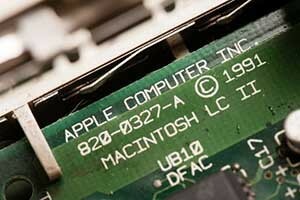 Officially Apple Computer Inc. for its first 30 years, the company dropped the word "computer" from its name on Jan. 9, 2007 – the same day Jobs unveiled the first iPhone. The iPhone, which today generates about two-thirds of Apple's revenue, would have been almost impossible to produce just 16 years earlier. In addition to being much larger in physical size, the equivalent technology in 1991 would have cost vastly more. One estimate put the cost to build an iPhone in 1991 at $3.56 million. Now $649 seems like a bargain, doesn't it? Apple Inc.'s history has been one of extremes. The Apple II brought early success, with the stock jumping more than 300% in its first decade. But the company struggled in its second decade, with Apple stock plunging more than 70% by 1997. Things got so bad that CalPERS (California Public Employees Retirement System) declared Apple the worst-run company of 1996. From 1997's lows, however, AAPL stock has soared about 18,000%. In February 2015, Apple became the first U.S. company in history to reach a market capitalization of $700 billion. Apple's peak valuation was about $775 billion. Apple became the most valuable company in the world in August 2013, when it passed Exxon Mobil Corp. (NYSE: XOM). Apple's annual revenue is bigger than the gross domestic product (GDP) of most of the world's nation s. For FY 2015, Apple pulled in $234 billion in sales, placing it in 46th place, just below Greece and just above Portugal. The World Bank lists GDP data for 193 countries. As of Apple's Q4 2015, it had $206 billion in cash on its balance sheet – by far the most of any company. 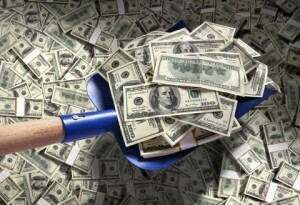 That's enough to give every man, woman, and child in the United States – nearly 323 million people – $638 each. By revenue per square foot, the Apple Retail Store is by far the most successful retail chain in the United States. The Apple Stores rake in about $4,800 per square foot, easily besting Tiffany & Co.'s (NYSE: TIF) $3,132. And contrast that to a retailer like Macy's Inc. (NYSE: M), which generates less than $200 per square foot. Why does the title say 15 facts and then article cuts off after 5? You simply need to put your e-mail address in the box to see the remainder of the article. Thanks for reading Money Morning! We had an Apple IIe in our business in the early 80s, then went to Macs when they came out. However I don't have an iPhone, iPad or iPod. I'm semi-retired and am not interested. Plus I think they're overpriced. I had read somewhere that it costs about $12 to make the iPhone in China. If this is true, no wonder they're sitting on all that cash with that kind off markup! The $12 you mention is what it costs Apple to have the parts assembled. Those parts themselves cost more than $200. So Apple still makes a lot of money on each iPhone, but not quite what you thought! Thanks for reading Money Morning! I bought an iphone lately, and I am very diappointed at the way I have to spend a lot of time trying, sometimes unsuccessfully, to find out how some functions can be activated. My previous phone was an Lg costing 25 euro, and comparing , I find that it was easier to receive and make a call, to store a number or delete one, to send and delete a message,and some other functions that the iphone is capable of performing,than this i phone. I think that the programming of the many functions is not really as clever as it should vave been.